You have to wonder how that works at all. Every insurance transaction will be completely and very easily traceable. There's no way money could be sent fraudulently to an insurance company and then siphoned out to go to some brand of crook. Propaganda works best when those who are being manipulated are confident they are acting on their own free will. Yeah it perplexes me too Alan. Update, new card delivered fraudulent transactions and associated charges credited back to my account. Unfortunately they credited it back as sterling although all my card funds were euros. No online facility for me to reverse back to euros apart from transferring it back to my source sterling card and incurring the associated charges then transferring back as euros and a loss due to a lower exchange rate. Phone call to them cleared the situation up with them setting my account back to the situation before the fraud with no extra charges. raynipper and Devonboy like this. Further fallout from the fraud. 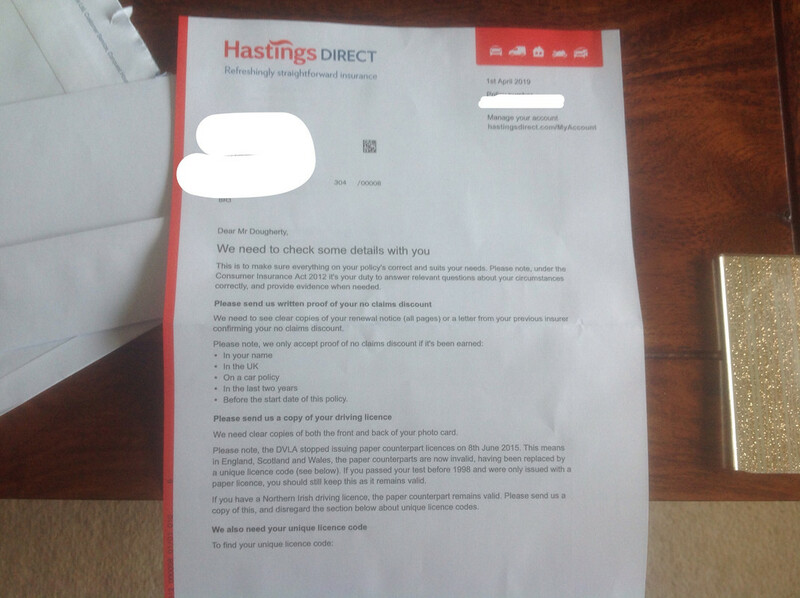 Received this letter today from Hastings Direct, they have obviously been one of the insurance companies my card details was used against. I have never insured any vehicle with Hastings Direct. They have handed it to their fraud team but did advise that I logged the incident on the 'ActionFraud' database. Do you know how they got your address Terry? Could be as simple as the phone book as the card has my name on it, the transaction I suspect the cloning occurred was made in Dublin and the NI accent would give a good starting point, but I'm sure such people have other more devious ways. Is it not very odd that the fraudsters apparently took out insurance in your name? Would it not have to be in their name to be of any benefit to them? Not having a criminal mind I don't know Jean. Would work if they were adding a named driver I suppose. Or maybe they're just not very bright. It did seem odd that they'd used your details to get 4 lots of insurance, was it? 8 different payment amounts to 4 Insurance Companies, the mind boggles Jean ?? ?